In this article, I will show you how to upgrade the kernel of Debian 9 stretch. I will download a kernel source from the official website of Linux kernel and compile it on Debian 9 stretch. Let’s get started. You can see that source code of different kernel versions is listed on the website. You can download the kernel sources as compressed tar file. There are mainline, stable, longterm kernels that you can download. If you’re upgrading the kernel of a production computer system running Debian, you should download the longterm or stable release. If you’re just testing something, you may download the mainline release if you want. Be warned, the mainline release may have bugs. If you care about stability, you should always get the stable or longterm releases. Your browser should prompt you to download the file. Click on “Save File” and click on “OK”. Your download should start. Before you can compile a kernel on Debian 9, you need to install some additional packages, basically the compiler and the required dependencies. Just press ‘y’ and press <Enter> to continue. Once the installation is complete, we can start the kernel compilation process. Now we can compile the kernel from source. Before you go any further, make sure you have more than 18GB-20GB of free space where you are going to compile the kernel. First go to the directory where you downloaded the linux kernel source. In my case, it is the Downloads directory on my HOME directory. 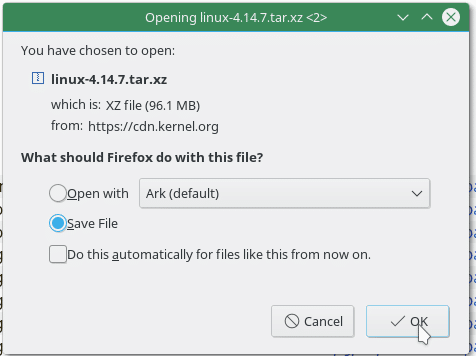 You can see from the output of ‘ls’ that the name of the file I downloaded is ‘linux-4.14.7.tar.xz’. Now we have to extract the tar archive. You can see that a new directory ‘linux-4.14.7’ was created. Now we have to copy the boot configuration into the ‘linux-4.14.7’ directory. We are doing these because it’s a lot of work to figure out what kernel module to enable, what to disable to get a working system. So we can just use the configuration that the current kernel is using. From the output of the following ‘ls’ command, you can see a config file marked black in the screenshot. This is the file we are interested in. 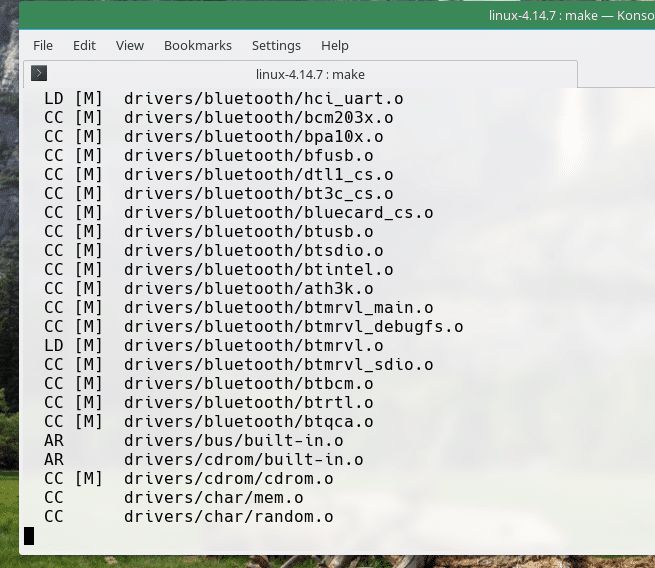 The new kernel may have a lot of new features that the old kernel didn’t have. So it’s a good idea to run the following command to convert the old configuration file to a new one. Otherwise we will be asked a lot of questions that might not make sense to you. You will be presented with the following window. From here you can enable and disable specific kernel features. If you don’t know what to do here, just leave the defaults. Navigate to “Exit” and press <Enter>. You’re done. The compilation process takes a very long time to finish. 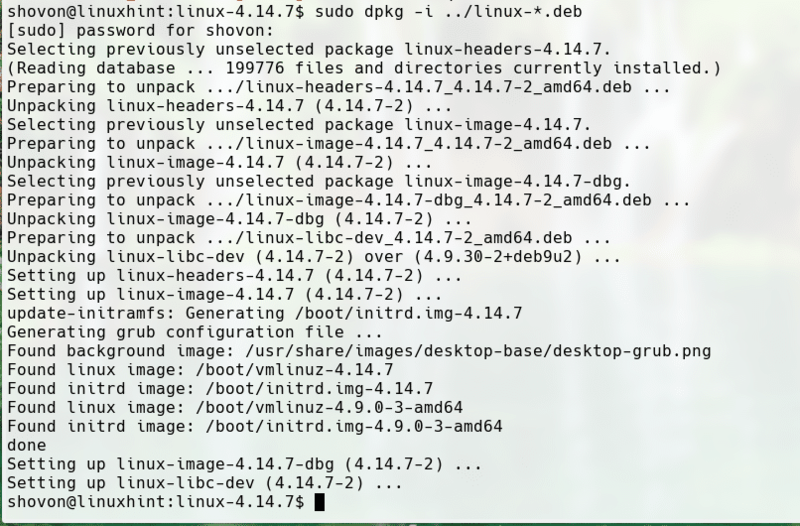 4 debian package files (.deb) will be generated outside of the ‘linux-4.14.7’ directory as you can see in the screenshot. Now all we have to do to update the kernel is to install all the generated .deb files. So that’s how you update the kernel of Debian 9 stretch. Thanks for reading this article.